Ever since our very first trip to Europe, we’ve been obsessed with churches. Wait…Stop, If you have not traveled abroad yet you don’t have the right picture in your mind because these are probably nothing, and I mean nothing like the place you go to worship on Saturday nights or Sunday mornings. Nope, these places are amazing! 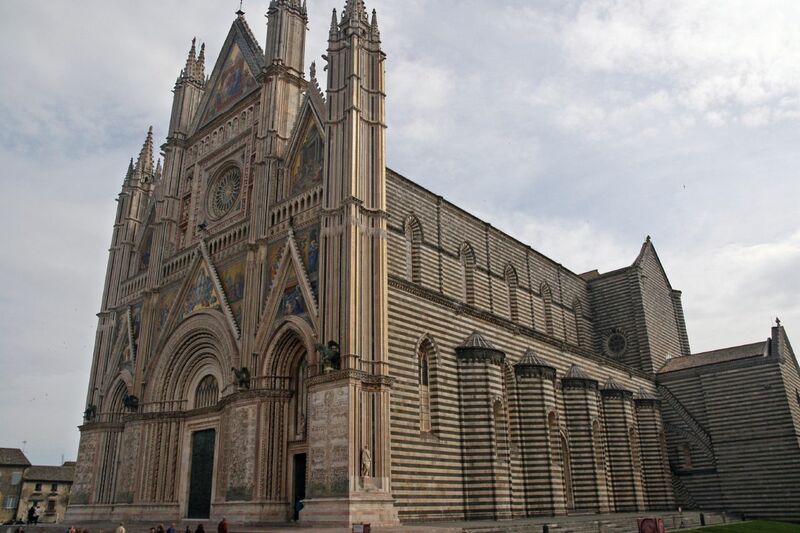 Take for example the Duomo of Orvieto, Italy. Duomo is the term for a church that is either a present or former cathedral. If there is no bishop currently at the location it is not called a Cathedral, but still can be a Duomo. Get It? The Duomo of Orvieto is a 14th century cathedral in Umbria, central Italy which actually sits on a volcanic plug (a volcanic landform created when magma hardens within the vent of an active volcano)! But that is not what makes it special; the façade of the Duomo is one of the greatest masterpieces of the Late Middle Ages. Most impressive is the beautiful mosaic of the Coronation of the Virgin Mary on the top gable of the cathedral. If you can get past the absolutely phenomenal front and walk inside you’ll find 2 frescoed chapels depicting the Judgment Day. No trip to Tuscany is complete without a stop to see this beautiful Duomo. This entry was posted in Italy, Travel and tagged cathedral, churches, duomo, orvieto on January 21, 2014 by Paul - GetAway Travel Service.